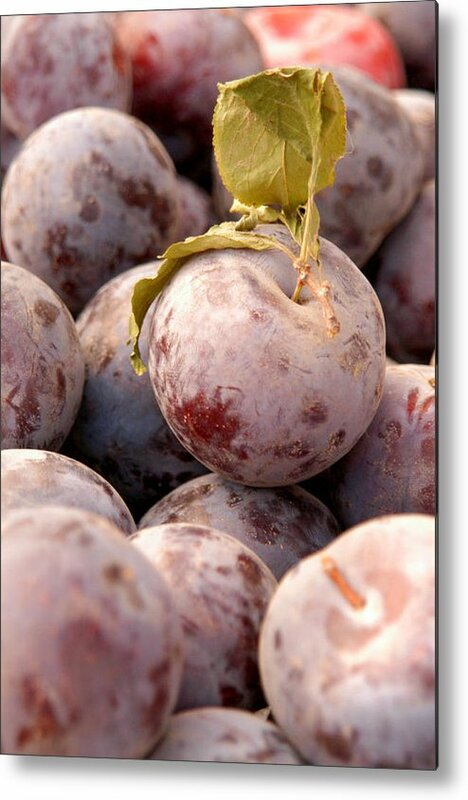 Italian Plums At Market by Jeelan Clark - 6.625" x 10.000"
Italian Plums At Market metal print by Jeelan Clark. Bring your artwork to life with the stylish lines and added depth of a metal print. Your image gets printed directly onto a sheet of 1/16" thick aluminum. The aluminum sheet is offset from the wall by a 3/4" thick wooden frame which is attached to the back. The high gloss of the aluminum sheet complements the rich colors of any image to produce stunning results. 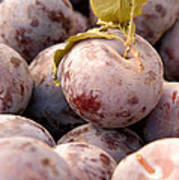 There are no comments for Italian Plums At Market. Click here to post the first comment. 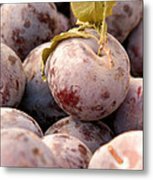 A plum or gage is a stone fruit tree in the genus Prunus, subgenus Prunus. The subgenus is distinguished from other subgenera (peaches, cherries, bird cherries, etc.) in the shoots having a terminal bud and solitary side buds (not clustered), the flowers in groups of one to five together on short stems, and the fruit having a groove running down one side and a smooth stone (or pit). 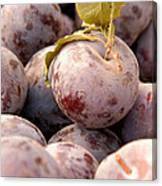 Mature plum fruit may have a dusty-white coating that gives them a glaucous appearance; this is easily rubbed off. This is an epicuticular wax coating and is known as "wax bloom". Dried plum fruits are called dried plums or prunes, although prunes are a distinct type of plum, and may have antedated the fruits now commonly known as plums.